Helen Biggs from UCL Special Collections and Jay Bhadricha from First Story preparing for the visiting teachers. Last year we built on our valuable relationship with the charity First Story to devise a CPD event for GCSE English Language teachers. 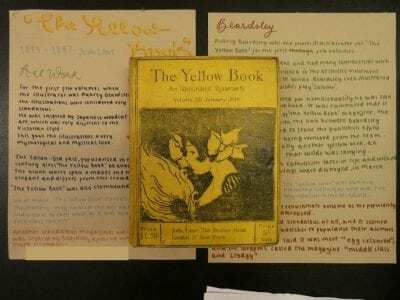 The event sought to help teachers develop ways of enabling pupils to write creatively on topics they know little, or nothing, about (in response to current GCSE examination expectations), using Special Collection items as examples of prompts. We’re running this event again (only bigger and better!) on the evening of Tuesday 19 March. If you are a Secondary school English teacher and would like to attend, you can get tickets here. Our vision for 2019 is to develop school relationships in a strategic way. We want to reach as many young people as we can, sharing the incredible collection that we look after, with meaningful, enriching experiences; one way to do this is to develop a ‘menu’ of curriculum relevant workshops that schools can book with us. We have a team of volunteer researchers helping us to find unique items that are relevant to curriculum areas and once we have made the resources and planned the workshops we will pilot them with the schools with whom we have a close working relationship. A slide from the PowerPoint for the Year 11 session on Stevenson’s ‘The Strange Case of Dr Jekyll and Mr Hyde’. 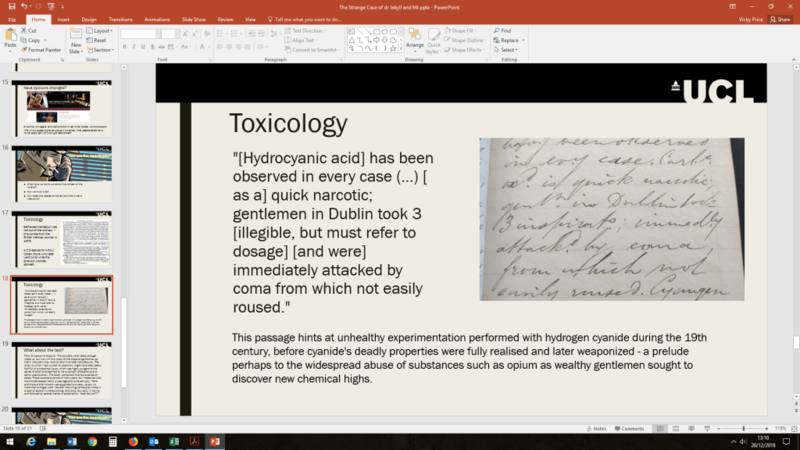 It features a section of a Toxicology lecture from UCL (Christison, Robert, 1831, Christison Lecture Notes, MS ADD 316) regarding gentlemen’s recreational experimentation with Cyanide. This was found by a volunteer researcher. An example is our session for GCSE pupils that explores the context of Stevenson’s The Strange Case of Dr Jekyll and Mr Hyde. We recently piloted it with Year 11s at East London Science School. We have also developed a workshop on the context of Mary Shelley’s Frankenstein. Our vast collections covering British and European medical history have meant the session features unique resources; surprise and intrigue abounds in Year 10 classrooms as they learn about the practice of body-snatching, and just why Carswell’s drawings are so important! For the second year running, we are working with School21 in Newham to participate in their Real World Learning programme. This provides both students and their host workplaces with something that is more meaningful and authentic than a traditional work experience programme. For a term, two Year 12s are spending half a day each week with UCL Special Collections, solving an authentic problem for the department. 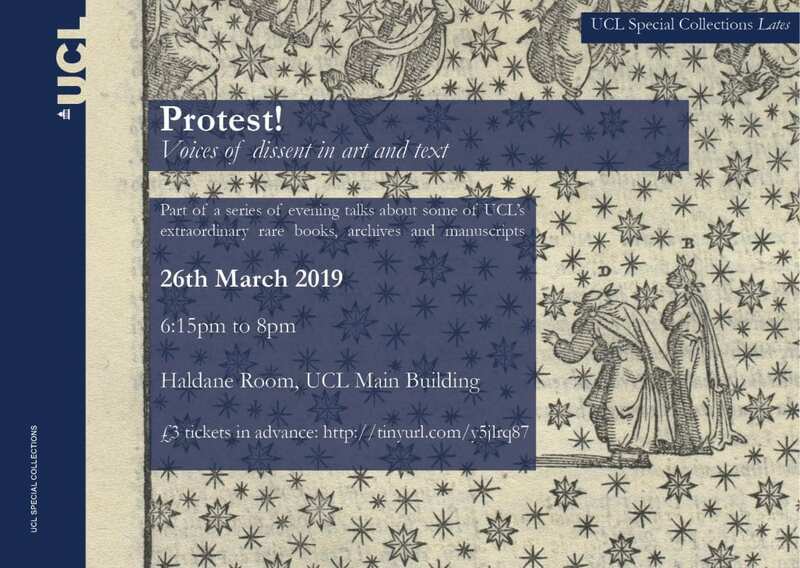 Last year’s participants worked to develop a crowdfunding campaign to raise funds to conserve and digitise selections from UCL’s collection of student magazines (from the College Archive). We’re excited to see what their successors Munna and Umar will do this year; we have given them the task of creating welcome resources for a new landing page on our website. After the success of 2018’s UCL Special Collections Summer School, we are happy to announce that we were successful in our bid to Widening Participation to run another programme this summer. This year we are taking inspiration from the Slade Small Press project Visions of Protest, which aims to provide a forum to examine the status of contemporary protest in Small Press Publications. UCL Special Collections’ Summer School, Protest in Print, will be a smaller, more compact and easier to access iteration of this. Protest in Print will offer participants an opportunity to be creative and hands on, applying what they learn about small press publications (such as those in the Little Magazines and Alternative Press collections) archives and rare books in practical ways. The result will be a public exhibition of their work alongside a display of examples of collection items that have inspired their work in the South Junction Reading Room – watch this space for dates and times! 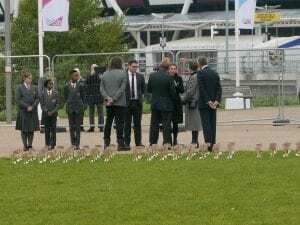 The biggest achievement of the Autumn Term was also undoubtedly our highest profile project to date: working as partners in the Shrouds of the Somme installation at Queen Elizabeth Olympic Park, alongside other organisations such as the Commonwealth War Graves Commission and the London Legacy Development Corporation. We delivered an education programme to schools in the Park’s neighbouring boroughs, reaching almost 1000 pupils. We wrote a blog about this project as part of our department’s Advent Calendar – to read more, click here. Text by Helen Biggs and Vicky Price. Thousands of children have been involved in an immersive First World War education programme that UCL Special Collections have played a key role in delivering. This was part of the Shrouds of the Somme project, one of the major centrepieces of Armistice commemorations that took place at the Queen Elizabeth Olympic Park from Thursday 8 to Sunday 18th November this year. The Shrouds of Somme project is the brainchild of Artist Rob Heard, who has spent the past five years making more than 72,000 small shrouded figures, each one representing one of the men killed and never recovered from the battled field at the Battle of the Somme. On Thursday 8 November, each of the shrouds were laid out as a graphic reminder of the scale of sacrifice they made in the Great War. The installation welcomed just under 3000 school pupils as well as around 85,000 members of the public. Photographs of the Shrouds of the Somme installation and artist Rob Heard, courtesy of the Shrouds of the Somme. 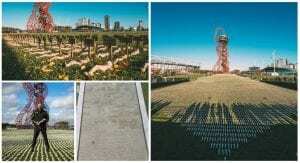 UCL Special Collections teamed up with the Commonwealth War Graves Commission and UCL Institute of Education’s First World War Centenary Battlefields Tour Programme to create free online teacher resources, worksheets for visiting schools and a programme of workshops for schools in the neighbouring Olympic Park boroughs (Tower Hamlets, Hackney, Waltham Forest and Newham). Special Collection’s Education Coordinator, Vicky Price, delivered 33 workshops, visiting 12 schools and reaching almost 1000 pupils. Pupils at Randal Cremer Primary School in a workshop delivered by UCL Special Collections. 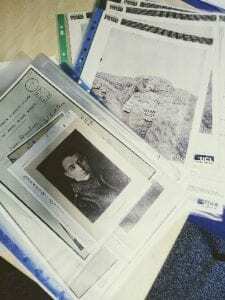 Resource packs for Shrouds of the Somme workshops. The workshops combined historical enquiry with creative writing and used primary resources from UCL‘s College archive. Through exploring archival items like Rosenberg’s student record and a publication of perhaps his most famous poem, Break of Day in the Trenches (in Poetry: a magazine of verse. Vol. IX (3), December 1916 [reprint edition, 1966], STORE Little Magazines), pupils learnt of the poet Isaac Rosenberg, who had been a student at the Slade School of Fine Art. He grew up in a Jewish working class family in Mile End and went to art school to become a painter. When war broke out, he volunteered to fight, sending poetry back to the UK from the trenches. He was killed in France in 1918. But where does the royalty come in? (I hear you say). Well, we were honoured to be invited to attend a visit by The Princess Royal at the installation site. Vicky Price (UCL Special Collections Education Coordinator) shook the Princess’ hand and explained the work we had done alongside pupils and the Head Teacher from the Bobby Moore Academy. The Princess Royal meets Vicky Price from UCL Special Collections, alonside pupils and Head Teacher Dr Foley from Bobby Moore Academy at the Shrouds of the Somme installation. Last week saw UCL Special Collections hold its first Widening Participation Summer School. 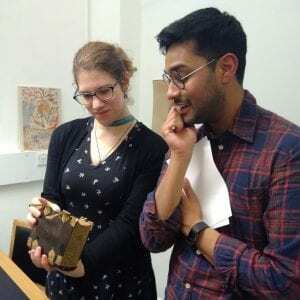 For four days, a group of twelve 17 year olds from in and around London explored archives, rare books and manuscripts here at UCL, guided by colleagues within Special Collections. We had brilliant time, and were impressed with the students’ ability to link collection items to areas of their own knowledge and contextual understanding. We also spent a day at The National Archives, visiting their current exhibition, Suffragettes vs. The State, and discussing the notion of authenticity in relation to exhibition interpretation. The participants then got to work researching collection items from UCL Special Collections, developing interpretation for a public exhibition on the final day. We would like to thank everyone at Library Services for accommodating the group, whether that be in the Science Library or the Institute of Education Library, and for Special Collections colleagues who offered their time and expertise.